Spectroscopy of Polymer Nanocomposites covers all aspects of the spectroscopic characterization of polymer nanocomposites. More than 25 spectroscopy characterization techniques – almost all used in materials science – are treated in the book, with discussion of their potentialities and limitations. By comparing the techniques with each other and presenting the techniques together with their specific application areas, the book provides scientists and engineers the information needed for solving specific problems and choosing the right technique for analyzing the material structure. From this, the dispersion structure of fillers, property relations and filler-polymer interactions can be determined, and, ultimately, the right materials can be chosen for the right applications. Besides the techniques and structure-property relations, aspects covered include: phase segregation of filler particles, filler agglomeration and deagglomeration, filler dispersion, filler-polymer interactions, surfaces and interfaces. 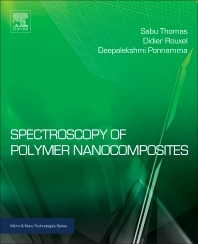 The book also examines recent developments, as well as unresolved issues and new challenges, in the characterization of surfaces and interfaces in polymer nanocomposites. This handpicked selection of topics, and the combined expertise of contributors from industry, academia, government and private research organizations across the globe, make this survey an outstanding reference source for anyone involved in the field of polymer nanocomposites in academia or industry. Dr. Didier Rouxel is a Professor at the Institut Jean Lamour, Université de Lorraine, France. Prof. Rouxel has been involved in the spectroscopic analysis of inorganics and is vastly experienced in the analysis of polymer nanocomposite systems by almost all spectroscopic techniques. His major areas of interest include elastic properties of polymeric materials studied by Brillouin spectroscopy, development of polymer nanocomposite materials, development of micro-devices based on electro-active polymers, piezoelectric nanocrystals, microsensor development for surgery, cell excitement in organic medium by piezoelectric polymers etc. He has written 80 publications, 6 book chapters and 138 communications. Dr. Deepalekshmi Ponnamma is working as a post-doctoral researcher at the Center for Advanced Materials, Qatar University. She recently obtained her PhD in Material Science from the Institute of Frontier Materials, Deakin University, Australia, and previously worked at the School of Chemical Sciences, Mahatma Gandhi University, India. She has over five years of research experience and has extensive knowledge in the field of polymer nanocomposites. Her research is focused on nanomaterials such as carbon nanotubes and graphene and the significance of developing technologically applicable polymer nanocomposites. She has also studied the properties of elastomer nanocomposites with the help of spectroscopic techniques. She has written 13 publications in international journals and 10 book chapters, and has edited 4 books. She has presented many papers at international conferences and has won best poster and oral presentation awards.